Situated at an altitude of about 1600 m above sea level, Situ has an alluring panorama. Like the green carpet of tea gardens of nature, coupled with the cool, clean air and warm sun, giving the impression of peace and tranquility itself for visitors. Lake Patenggang or better known as the Situ-Patenggang by local people, occupying an area of ​​150 Ha. This area was once an area of ​​nature reserves or national parks, but in 1981, has officially turned into a tourist park. To enjoy this attraction there are facilities that boats can be rented for around a small island located in the middle of the lake by the name of the island Sasuka. This island looks shady with many tall trees that grow in it. While across the lake there is a pretty interesting site called Stone Love allegedly believed would provide the continuity of love for couples who come to visit these localized. Boats are available are quite numerous, and in good condition or well maintained when I visit there. Boat colors are bright enough or markedly contrasts with the surrounding environment is dominated by green color. Water transportation facilities are rented at this place a rowboat rental, boat and water bikes at a price that can still be negotiated with the owners. There is also a gazebo facilities and places to sit without a roof made of cement for the purpose of enjoying the surrounding panorama of the lake. Food business was not a difficult thing because the number of vending stalls that lined near the parking area. This would be different if visitors use private vehicles (either 2 wheel or wheels 4) or with a bus group. Road conditions are average (paved), facilitate the visitor to come to the region. Along the way to the carpet emblazoned Situ forests and tea gardens. Strawberry plantations also were encountered during the trip. Strawberry plantations generally provide facilities for visitors to pick their own strawberries from trees that were planted in plastic bags. Situpatenggang or Lake Patenggang has such a calm lake water, and air is so fresh. Convenience will be easily obtained during a visit to this popular vacation spot in Bandung. Besides other attractions in the form of stories about Situpatenggang which is a romantic legend in ancient times. 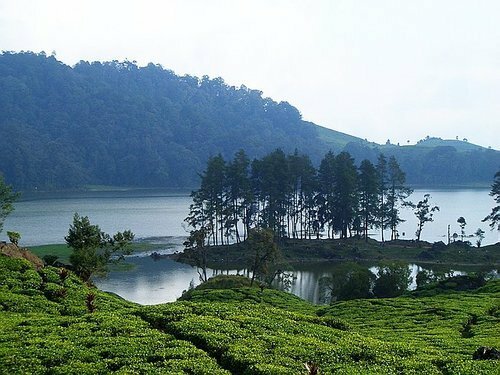 Lake Patenggang or better known by the local community Situ, occupies an area of ​​150 Ha. This area was once an area of ​​nature reserves or national parks, but in 1981, has officially turned into a tourist park. The area has a legend that appears Situ name. History or myth about this situ surface due to a prince and a princess who fell in love. Their love story but is not as smooth and as beautiful as envisaged by the two separated by circumstances. So That Their tears formed a lake there or. The next lake was named after the Situ taken from the word-teangan pateangan derived from the Sundanese language means looking to each other. In the end they can get together again on a stone in it is called the stone of love. It is said that anyone who has been with her partner, then their love will be eternal. Interesting is not this resort?